Movies, television shows, and Broadway plays have popularized (even glamorized) the perennial paper route for kids. Perhaps your child has watched "The Paper Brigade." The Disney classic stars 14-year-old Gunther Wheeler, who moves to a new town and gets a job as a local paperboy because he needs money to buy a concert ticket for a girl he likes. But is your children ready for a newspaper route job? If your son or daughter wants to get a part-time job to earn some extra cash above his or her allowance, then a paper route might be a great opportunity. 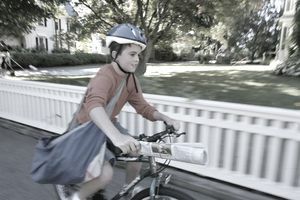 Delivering newspapers is one of the most common tried-and-true ways to earn money, and has been the first job for many children ever since Schwinn started making bicycles. However, such jobs are increasingly scarce. Many newspapers have shut down or reduced the number of editions they sell. Additionally, some papers now rely on adult paper delivery services rather than hiring youngsters the way they used to. However, let's start with valuable life lessons your child will learn about money. If your child’s route includes collections, asking for payment is a great money skill to master. He will learn to responsibly handle money that isn’t his, and it will help him become more assertive when dealing with others. Extra tips can teach your child a valuable lesson about how to handle extra money that he wasn't expecting. It may come as a surprise, but newspaper couriers (even as young as 12) do suffer penalties, namely when it comes to complaints. If someone on your child's route files a complaint, it’s deducted from their paycheck. Penalties vary but each complaint can cost $2 to $3. Paper delivery routes often have customers that tip, whether it is weekly or just at Christmas time. Better service often results in more generous tips! According to the Bureau of Labor Statistics, those delivering newspapers earn a median wage of $11.48 an hour. Here's a simple....Nintendo System Super Mario Bros Video Game sells for $79.99 on Dell's website....: Your son or daughter will need to deliver seven newspapers to save up $80.36 in order to nab this video game. If your child isn't into video games (if clothing or jewelry is their thing) have them calculate how many papers will have to deliver in order to buy whatever is on their wish list. This also helps sharpen their math skills. If your child gets a route where he can ride his bicycle every morning during deliveries, he will be getting a great workout while he is earning money. Knowing he is doing a great job at something that people appreciate can show your child how capable he is, and that is a great confidence booster. Paper routes depend on punctuality of the paper delivery. Your child will learn to deliver the papers by a specified time each morning. One of the best things about having a paper route is that other than having papers delivered by a certain time, paper deliverers have the freedom to do their route as quickly as they want, in the order that they want; and they don’t have to dress up to do it! If you have two or three family members who want to share a route so they don’t have to work as many days, this is usually just fine. Another idea: have one person prepare the papers and have someone else manage deliveries. Just like the mail, snow, sleet, and rain cannot stop the newspaper delivery person; your child will be facing adverse weather conditions and might need to be driven when the weather gets too fierce. Newspapers have to arrive early, many times by 5:00 in the morning. Keep in mind, your child will have to prepare the papers first, which means they might have to be up as early as 2:00 AM to get the papers out on time. Some paper routes include collections, and it can be intimidating for some children to ask strangers for money. Keep your child’s personality in mind if his route includes collecting money. Depending on the neighborhood, a kid with cash in his pocket can become a target for crime. Because of the scarcity of newspaper routes, some kids are turning to pet sitting jobs, dog walking jobs, or they're learning how to run a lemonade stand. All of these are viable alternatives. Whichever way they go, they'll learn life-long lessons.